The Rockport Film Review: A "Mustang" Cannot be Tamed! The 2015 film “Mustang” was nominated for an Academy Award in 2016 for Best Foreign film but unfortunately didn’t take home the prize. 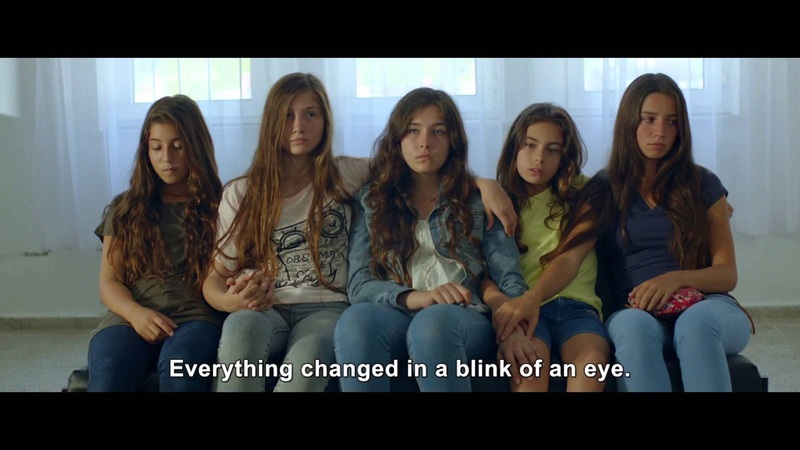 Writer/Director Deniz Gamze Ergüven's film is the story of five fiercely independent sisters who must fight against aging cultural norms to find freedom and take control of their own lives and bodies. Placed in rural Turkey with strict religious and moral standards, girls and women have very little freedom. The whole society seems to be stuck in some sort of medieval time warp. Lale, Nur, Selma, Ece, and Soney are your average fun loving and respectable girls who on the last day of school play around in the ocean with a group of boys. This seemingly innocent horseplay between friends becomes scandalous and labeled as obscene behavior. Chastity must be protected at all costs. The girls are even taken to the local doctor to ensure they are still virgins. Raised by their aunt and uncle the girls are put on house arrest but escape now and again forcing them to turn the house into a formidable prison that backfires at the film's conclusion. The future is pretty bleak for the women in this society after a girl has her first period she is fit to be married off. The girls are more of a traded commodity than an actual person. The town’s older women get together to play matchmaker over tea and biscuits. The merchandise (the girl) plays hostess and tries to make a good impression. Family prestige, wealth, and subservience play key roles. Then the men are brought in to broker the deal. The girl's youthful innocence and tight bond slowly get torn apart. Sonnay, the oldest, is married off first. Her depressed, melancholic attitude during the whole ceremony is ignored as the man is celebrated. The marriage customs are equally archaic and bizarre. The bedding ceremony and bloody sheet inspection, to confirm she has in fact lost her virginity, are just unbelievably intrusive and gross. After the first two sisters get married off Lale starts to feels abandon and betrayed and decides that this will never happen to her. She dreams of escaping with her remaining sisters to Istanbul to start lives of their own. When its Ece’s (the middle sister) turn to be auctioned, she doesn’t want anything to do with it and after acting out at the dinner table and sent to her room and in a final act of defiance kills herself. All of these people seem to have no sense of free will and are all slaves to traditional values. The men do whatever they can to quell any uprisings to keep their oppressive power. When it comes time for the next sister to be married off, the girls are in full revolt mode and right before the ceremony, the girls lock themselves in the house. By now the house has been turned into an impenetrable fortress, and the furious men are unable to get in. Things get extremely intense and If the girls are caught they will be killed! They are able to slip away and eventually get to Istanbul and hopefully a better life. Although its hard to imagine that this kind of stuff still exists in the world it is all too prevalent.